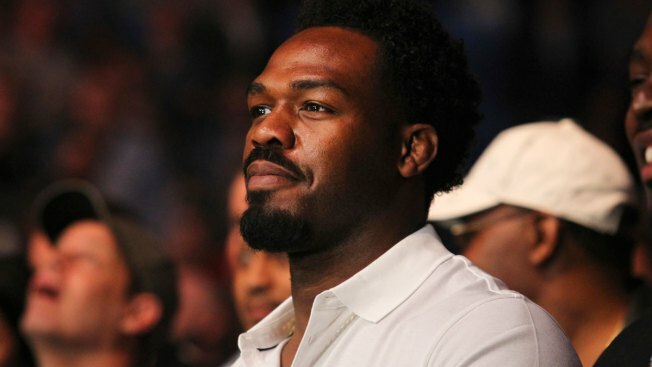 Mixed martial arts fighter Jon Jones watches a bout at UFC 210, Sunday April 9, 2017, in Buffalo, N.Y.
Former UFC light heavyweight champion Jon Jones is eligible to return to competition by late October after completing a 15-month suspension for a doping violation. "It's difficult to express myself at this moment, but I can definitely say my heart is filled with gratitude and appreciation," Jones said in a statement posted on his social media accounts. "I want to thank all of you who have stood by me during the toughest stretch of my life. It has meant the world to me and always will. But now is the time to shift the focus front and center to the road ahead. Greatness is what I'm chasing and the path to reclaiming my throne is now officially open. Comeback Season begins now." Jones could have been suspended for four years for a second failed test, but arbitrator Richard H. McLaren determined the ban's length by evaluating Jones' degree of fault. Jones claimed he didn't knowingly take any banned substances, and he passed several out-of-competition drug tests leading up to his failed in-competition test, one day before UFC 214 in Anaheim, California. California State Athletic Commission executive officer Andy Foster said his group is "agreeable, in concept" to the 15-month suspension, but added that Jones still must pay a $205,000 fine. Lightweight champion Khabib Nurmagomedov used an expletive to refer to USADA while complaining its decision includes too "much politics." Heavyweight Curtis Blaydes also weighed in : "No shade to JJ but no one is surprised by this arbitrary decision. USADA is steadily losing respect in the fight community to the point of questioning why they even exist." Jones tested positive for cocaine use in 2015, later publicly acknowledging that he used the drug. His checkered history also includes an arrest after a hit-and-run accident in New Mexico in which he broke a pregnant woman's arm in 2015, a scuffle with Cormier in a casino lobby while promoting a bout in 2014, and an arrest for driving under the influence after he crashed his Bentley into a pole in 2012.